Green Cymbidum Orchids come in many pleasing shades of green. They can range from light green to dark green and they can have red, green, white, pink or yellow centers. They are awesome because despite being green they always look like a flower and are not likely to be mistaken for leaves. Whether you are looking for a cut flower or for a great orchid plant, these orchids are ideal specimens for you. These orchids make great flowers for proms or for weddings. They make exceptional and long lasting bouquets and are also perfect for boutonnieres. The great thing about them is that they can last a very long time as a cut flower. With the proper care they can last several weeks, so you can order them a few days early if you have a special occasion coming up. These flowers will be shipped to you in a box, while still attached to their stems. Online retailers will ship them with water tubes on the end of their stems to keep them from drying out. When you get them, you need to unpack them and remove their water tubes. Next you need to trim a quarter of an inch from the end of their stems to open up their pores and then you need to place them in a vase filled with clean water. Store them in a cool room at about 65 degrees and keep the room as dark as possible until your big event. Stems of these flowers can be up to twenty-three inches long and you will usually find eight to twelve flowers on each stem. 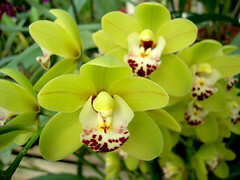 And some cymbidiums can have scents that smell like sandalwood or even citrus. They are also known as “boat orchids”, unfortunately I have no idea how they got this name. Green cymbidium orchids usually bloom during the winter, but of course if you can manipulate their growing environment you can get them to bloom whenever you want them to bloom. If left on the plant, their flowers can last up to ten weeks. So if you have a green thumb you might want to consider growing them, rather than buying them as a cut flower to put into a vase. These orchids used to be very popular in victorian era Europe, because they were able to tolerate cold european winters better than many other species of orchid. They can survive temperatures as low as forty-five degrees, but I wouldn’t push things too far if I were you. Are you interested in buying rare orchids? One of the top orchid breeders in Hawaii is located about 9 miles away from our farm. He has been developing exotic new varieties of orchids for a number of decades and he has quite a few varieties which are either one of a kind (since they are completely new hybrids that he created) or one of less than a hundred (in the whole world). I’m thinking of adding a few of these incredibly rare orchids to our catalog, but only if there is interest. I would expect prices to range from $75 to $150 per plant. So are you interested in orchids that you can’t find anywhere else? If you are, please use our contact form to reach me.